My girls have SO many books, but I also believe a child can never really have too many books! The girls are always excited to get a new book and the arrival of the children's book Curious Creatures was no exception. This book was broken up into four sections : Rainforest Friends, Jungle Beasts, Polar Pals and Curious Creatures Down Under. 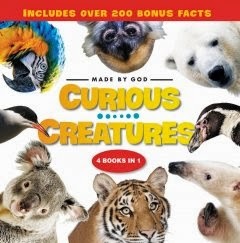 Each section is full of vivid pictures of animals in each environment and facts detailing how God made each animal special and unique. Curious Creatures can appeal to kids of all ages. My 2 year old loves flipping through and looking at pictures, while my 6 year old enjoying reading the fun facts and learning more about the animals. This book actually arrived at the perfect time for a school project. My first grader had to choose an animal and research facts about them. Curious Creatures made it an easy assignment for her. Although she was only required to write 6 facts, she wrote 4 "bonus" facts because there were so many interesting details in the book. As a mom, I am very happy with this book. My daughters love it and I appreciate that it reminds them that God made all the animals. I would recommend this book to others and think it would also make a great gift for children.